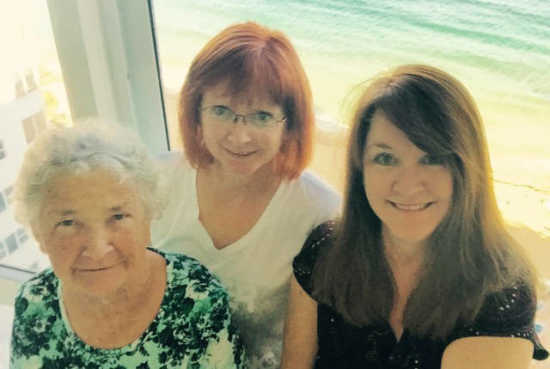 Bonnie Marquette with daughters Nancy Marquette Hashman and LeAnn Marquette Jankovitz. Joyful, clamorous voices, laughter, off-key singing and the thumping sounds of bouncing balls alert me that my favorite program has begun. Full of action, drama, fantasy and comedy, this reality show is not filtered through the television, computer, nor my cell phone, and it is not interrupted with commercial breaks. It is called “recess,” and it can be found on the school playground two to three times daily during the school year. This docu-drama presents with a cast of unique and colorful characters that range in age between 5 and 13 years, differing in gender, sizes, shapes, abilities, and personalities. Released from their classrooms, desks, chairs, and lectures, they share one common denominator - freedom. Freedom to make their own choices, write their scripts, create their own rules and interact in their ways. Observing the multitude in motion is fascinating. Left to their own devices the cast of crazies seek interaction, exploration, and movement. They learn perseverance, self-control, turn-taking and negotiation skills as they confront problems and challenges. They learn to be champions, or not, how to make friends and how to deal with rejection - all skills that will help them to make their way. They are having fun. I’m an observer now, aged out of the schoolyard playground where I no longer belong. The echoing sounds of my childhood recesses have faded to a distant whisper. Still, I have this yearning to play, to interact, to be silly, to connect, - a desire to find a playground and enjoy recess. Leave it to my mother to show me the way. At the age of 61, I’m still discovering how remarkably wise my mother is. Mom’s favorite line is, “You’ve got to keep moving, that’s the main thing.”. Now residing in a senior living community - she spends little time in her apartment. She walks hallways, driveways, she circles the buildings. She is exercising and staying strong, but she is also looking for interaction - a connection with humanity. She sees her smiles reflected in the faces of others, and her “hellos” receive friendly responses - even generate conversations. If she sits by the front door, someone will sit down next to her. Intuitively, she has found her playground and being the smart woman that she is; she enjoys “recess” especially when she can share it with others. If the world is a playground, I want to play and to see, as children do, “the magic.” I want to hear the ecstatic voices of children and my own - engaged and full of wonder. Thanks, Mom for showing me that when you look for joy, you will find it, and that is never too late for recess. — Nancy Marquette Hashman is a speech/language pathologist in West Chester, Pa. She grew up in Trenton, Neb., and is the daughter of Bonnie Marquette of McCook.